It’s important to understand the regulations and laws on truck weight when shipping your product. Each state has different requirements for truck weight and axle load limits that need to be accounted for. You will need to know pallet dimensions, product weight, and how much of your product can fit on a pallet. Knowing this is crucial when planning out your shipping costs. The standard truck weight limit is a gross weight of 80,000 pounds. Gross weight means the combination of the truck, trailer, and the cargo it is hauling. You can go over 80,000 pounds only if you acquire special permits and follow specific routes. This is when the specifications of the truck are important, because the weight has to be disbursed based on the number of axles and the spacing between each axle on the truck. Depending on the spacing between each axle will determine the amount of weight you can haul. The spacing requirement will range from 3.5 feet between axles for 9,000 pounds per axle, to over 9 feet spacing between axles for 18,000 pounds per axle. A semi-trailer must also not exceed 102 inches (8.5 feet) in width, and a height of 13 feet 6 inches. The reason for this is so all trucks remain safely below the overpass height and remain safely in their own lane while driving. These dimensions also play a huge role in how the truck is loaded with different pallet dimensions. This is why knowing how much your product weighs, and how much you are planning on shipping is so important when determining shipping costs. If your product is too heavy to load everything on one truck you will have to distribute the products on different trucks. This can raise your costs when it’s not planned for. 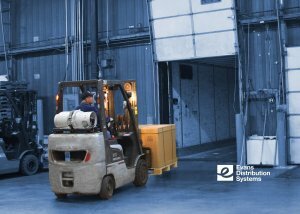 That information will allow a 3PL provider like Evans the ability to provide an accurate rate on shipping. Along with overall safety of all drivers, the weight limit restrictions are helpful for the upkeep of Michigan’s roads. The amount of weight a truck carries, and more specifically the disbursement of the that weight can cause a lot of damage overtime to roads. That is why the heavier the truck weight the larger the spacing between the truck axles is required. That is why if you get the special permit to haul above 80,000 pounds you are restricted to specific roads. Otherwise, having heavier trucks driving on the roads will cause more damage faster, and need to be replaced more often. Something else important to consider is the type of truck being used to ship the product. Here at Evans we predominately use semi-trucks with either a 53-foot or a 26-foot box trailer. This type of trailer is enclosed on all sides and is very common to see on the road because it’s so versatile. The majority of products can be shipped in these trailers, with exceptions to extra-large items or products with special needs like ice cream needing a refrigerated truck. This is why knowing any special requirements for a product is so important for a 3PL provider like Evans. Some trailers also have different weight restrictions combined with the state restrictions. The final piece of the puzzle is determining the pallet dimensions used for moving the product, and how they will be loaded for transportation. Pallets can come in different sizes, but the standard size is 48X40 inches. Once it’s determined how much of a product can fit on a pallet and the weight of the whole pallet, then you can plan how it can be shipped to keep the truck weight within state restrictions. The combination of product weight and pallet dimensions determines how much of the product is allowed on the truck. This will help determine the rate you will receive for shipping these items. Get in touch with us at Evans if you’re interested in finding out how we can positively impact your business. We’re experts in fulfillment and are always taking on new and interesting projects. No matter your business, we likely have a solution for you. Should I offer free shipping? Can I offer free shipping? How Does the Holiday Season Affect Small Package Shipping?